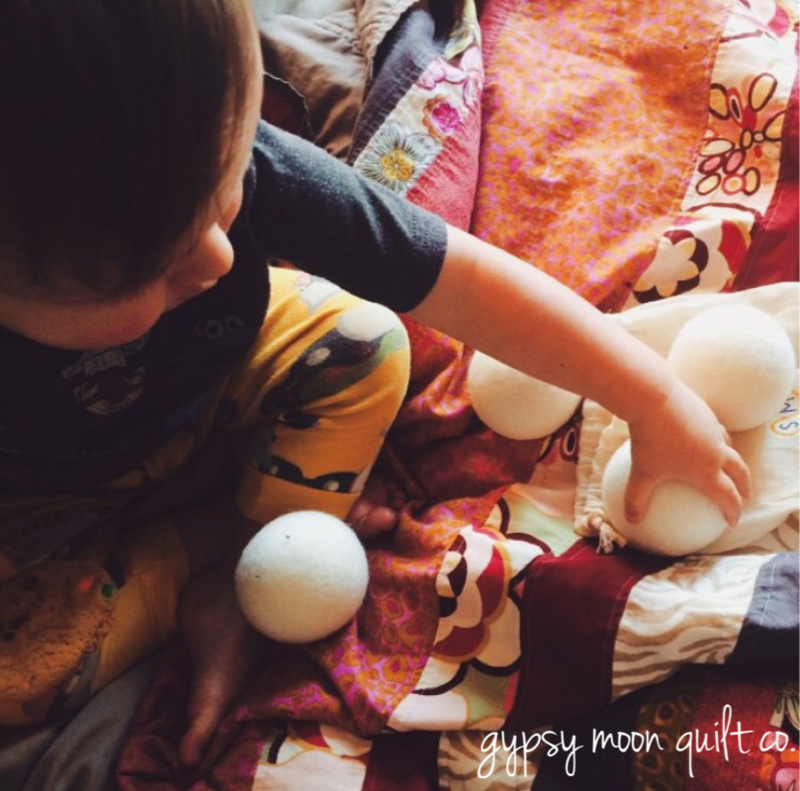 March 13, 2016 May 28, 2016 ~ Gypsy Moon Quilt Co. I started hoarding collecting vintage linens a few years ago with the hopes of making something fabulous… I just never knew exactly what. As I mentioned in a previous post, I started out quilting by using leftover fabric remnants and repurposed materials (mostly in an effort to de-stash while also cutting down on the cost of materials). Little did I know, I was also on the verge of defining who I was as a quilter. I’ve always tried my best to reduce, reuse and recycle when it comes to my crafting and sewing projects. As I started getting more serious about quilting, I also started thinking more about the environmental impact of fabric manufacturing and the textile waste involved. I knew there had to be a “greener” method of quilting that could make the process more sustainable, without sacrificing aesthetic and quality. That’s when I began to realize the awesome potential of my prized vintage linen collection.💡I played around with a few scraps and was hooked. This was exactly the vision I didn’t even know I had for these floral beauties. I made the quilt pictured above from the linens I already had stashed away. I loved the look and idea of giving new life to vintage and thrift-sourced materials so much that I decided, going forward, every one of my quilt tops, backs and bindings would solely be made from repurposed fabrics. –And in case you’re wondering, slicing into a gorgeous vintage sheet for the first time never gets any less terrifying, but the end result is always worth it! Minimizing the use of harmful chemicals is also something that’s extremely important to me. I’m always searching for more natural products and methods to use, not only in quilt making, but everyday living as well. While doing some research online, I happened to come across an article on the benefits of using wool dryer balls as a chemical-free alternative to dryer sheets. These are in no way a new concept, but if you’ve never heard of them, don’t worry. One can never be too late to a WDB party! These little guys are seriously fantastic! Not only do they help laundry dry faster, they also soften fabric, reduce static and are environmentally friendly. I’ve always used natural laundry detergents when washing my laundry, fabric and quilts, so finding a chemical-free way to soften fabrics while cutting down drying time in the process was a pretty sweet deal. Note: These are especially great for using with towels and cloth diapers as dryer sheets add a waxy residue to fabrics, repelling moisture and making them far less absorbent. Also, if you want to naturally scent your laundry, just add a few drops of your favorite essential oils before tossing the balls into the dryer. 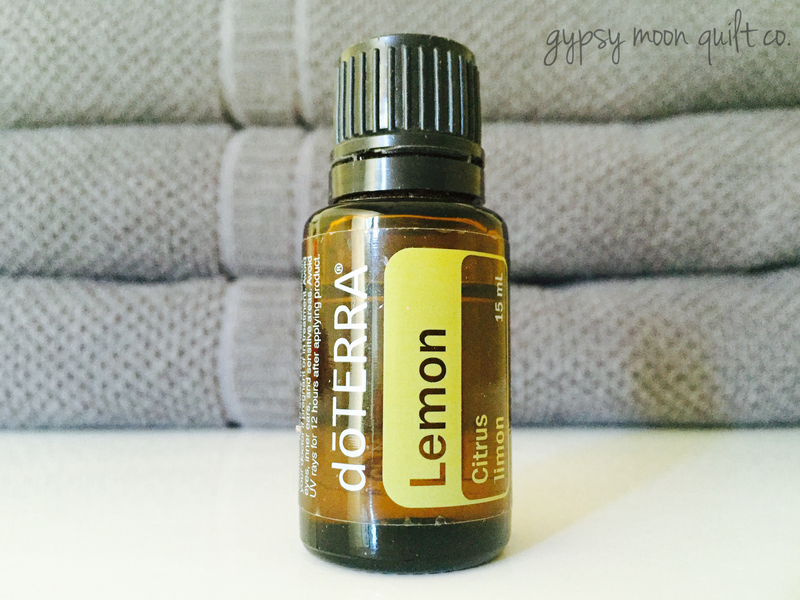 Some of my favorite oils to use are lavender, orange, tea tree, peppermint and lemon. You can also combine oils (peppermint + orange, lavender + cinnamon) for endless smelly-good possibilities! Growing Up Herbal has some really great info on Blending Essential Oils for Beginners. 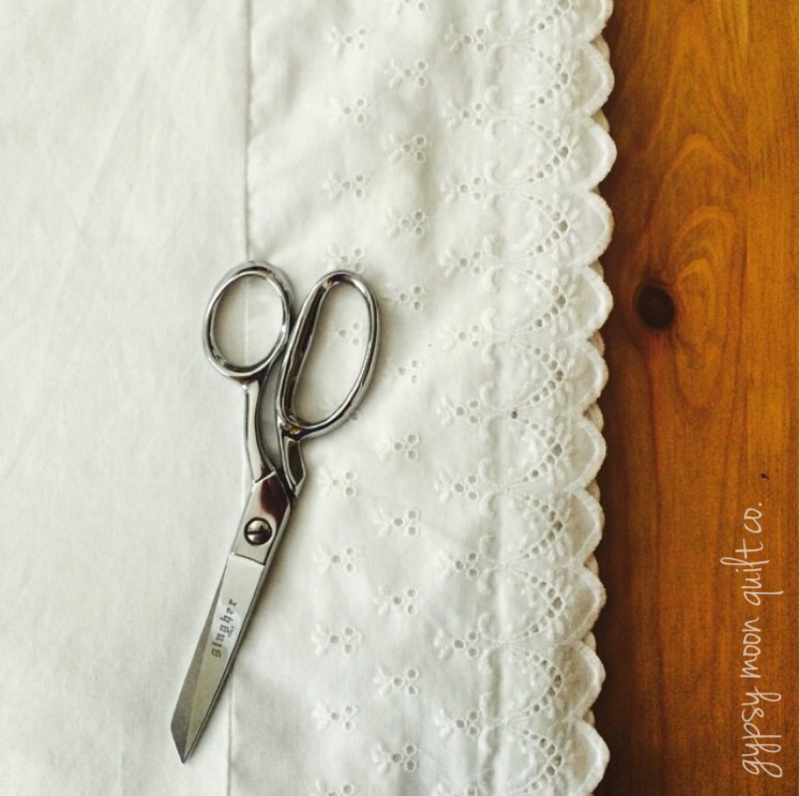 Are there any more thrifty quilters out there? I’d love to see your projects or hear any tips on staying green in the studio! I love this! I once made a quilt all from men’s shirts from thrift stores. This year I made a resolution to not buy any new quilting fabric (my exception is backing) and it’s been really hard because I love the modern designs! 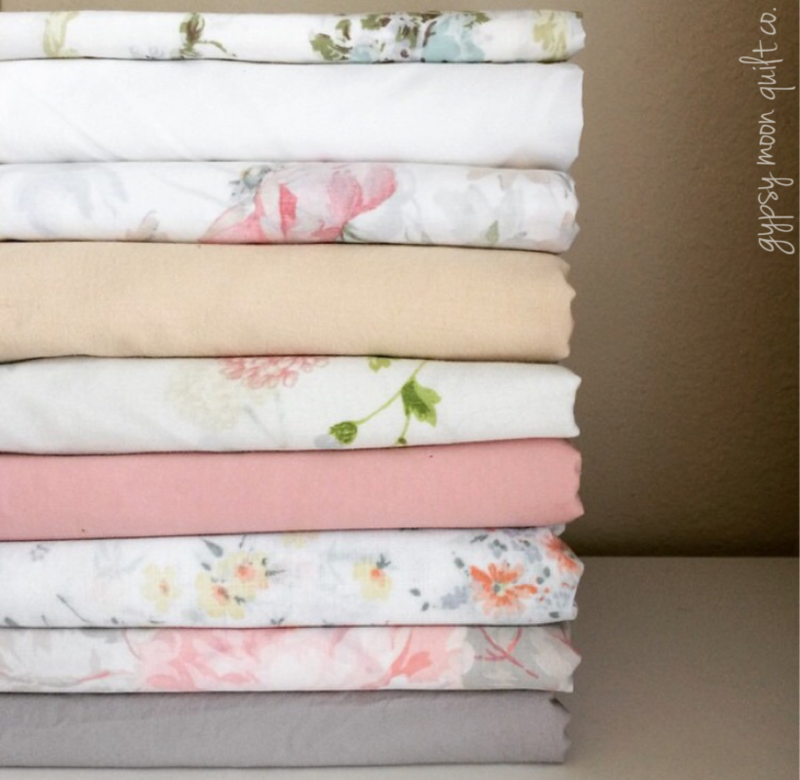 Where do you usually find your fabrics? I live in a small town with a small thrift store open 3 days a week, so I buy a lot of things online. 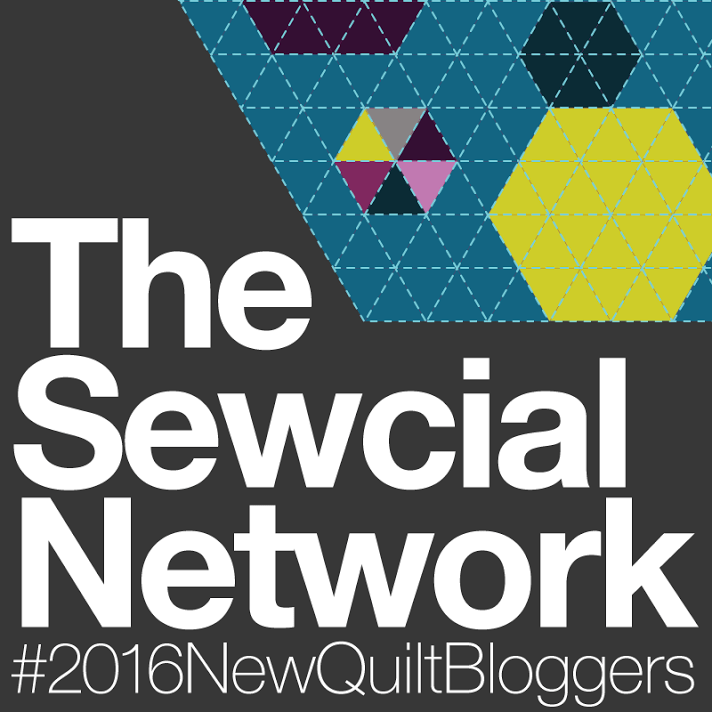 Pingback: 2016 New Quilt Bloggers – Blog Hop | Gypsy Moon Quilt Co. I love your blog and what you are doing with vintage/repurposed materials. I do love modern quilting fabrics but more and more am finding myself pulled in this direction. 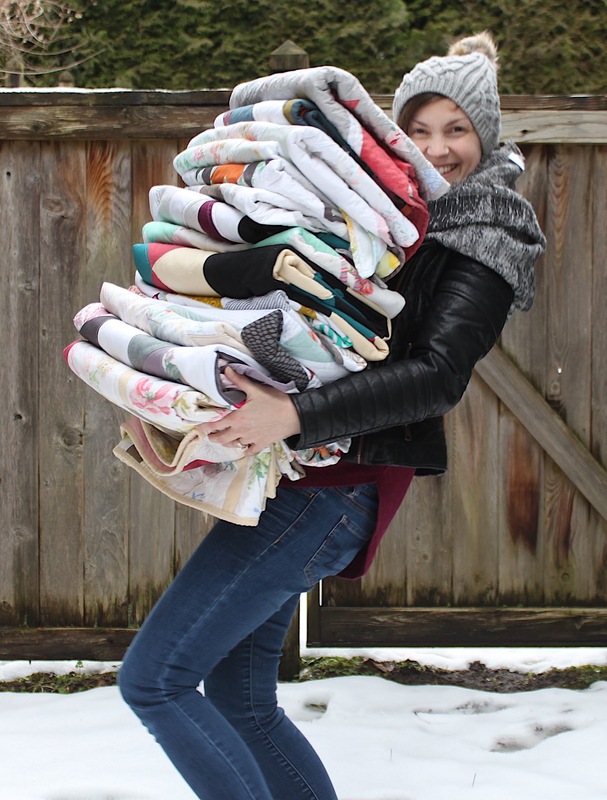 Found you through the New Bloggers Quilt Hop and am reading all your past entries because your stuff is so inspiring. One question about using repurposed stuff: have you ever had a run-in with pests of any type? I bought some thrifted sheets and panicked when I found two little critters on them. Luckily did research and they were not bed bugs (whew!) but carpet beetles. My current routine is that I first shake things out outside, then toss in the washer on “Sanitize,” then dry on high heat. Fingers crossed this is enough protection — but I’d love to hear any tips you might have! Aww, thanks so much! 😊 I’ve done a lot of research on pests, especially bed bugs. Heat-treating is absolute key! I pop all thrifted materials in the dryer as soon as I get them home and dry them on the hottest setting for 30 minutes. Then I wash and dry as normal (before and after quilting) again using the hottest settings possible. So, with all that said, sounds like you’re doing it right! The best tip I can offer is to pre-dry before you wash to ensure your protection. It’s a pretty extreme process, but better safe than sorry! Thanks for the info! I will definitely add an initial high-heat drying to my process. This post has me wanting to go thrifting today! This is so cool, Amanda! 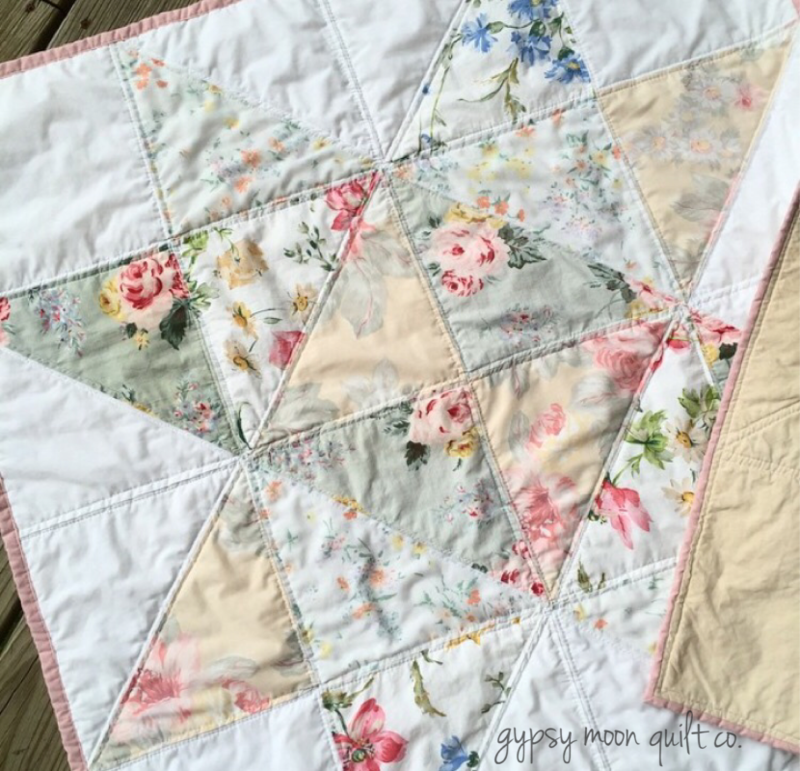 I love that vintage fabric quilt — the floral patterns are just so lovely. I’m trying to figure out how to properly get into refashioning. I do try to mend my clothes when needed and possible, and it would really be nice to learn to reclaim fabric. Thank you! ☺️ It’s equal parts fun, challenging and rewarding. I’m definitely still learning as I go. I 😍 wool balls! I’m new to essential oils and currently learning. I didn’t think to put a drop or two on the wool balls. How did you determine on what brand to go with?